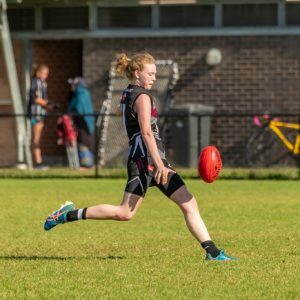 Camden Cats vs.North Shore Bombers – Fairfax Oval on Saturday, April 21, 2018. Premier Division newcomers Camden were back at home at Fairfax Oval for a twilight fixture against North Shore. The Cats were looking to rebound after a heavy loss on the road to Manly, and it was always going to be tough against one of the competition heavyweights. But although North Shore won comfortably enough, the Cats gave the Bombers a run for their money. The Bombers had two goals on the board in hardly any time at all, but the Cats worked hard to get back into the game. Some inaccurate kicking would count against them, and some of those shots should have been kicked. But the endeavour of the Camden players and their work-rate couldn’t be faulted as they were getting more of the ball than the Bombers and pumping it into their forward 50. An entertaining quarter of footy saw the Bombers kick four straight goals to Camden’s 3.6, and scores were level at the first change. There’s some good enthusiasm at the newly-promoted club, and more players from the earlier games had stuck around than what we often see. And they had plenty to shout about with an individual highlight, as Blake Pearce in the number 30 jumper took a run and four bounces up the wing before drilling the goal from just inside the 50. For a fleeting moment the Cats were in front; but their lead would be short-lived. A lead and mark to Brad Plug restored North Shore’s lead, and the Cats would not goal again until late in the third term. 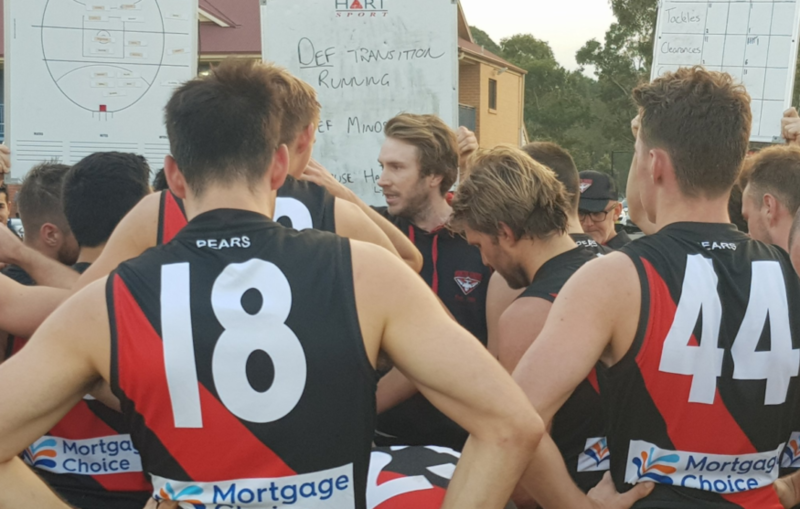 The second term would yield three goals to one in the Bombers’ favour, with the visitors leading by ten points at the long break. Day had turned into night when the third quarter got under way. 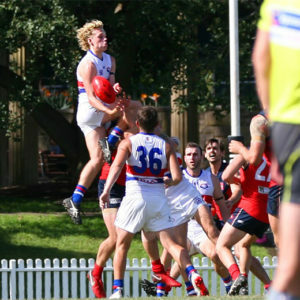 The Cats were putting up plenty of stiff resistance around the ground; but the North Shore defenders had the better of the Cats’ forwards and a string of strong defensive marks prevented the Cats from achieving any reward for effort. And the Bombers were finding avenues to goal at the other end. With the first four goals for the quarter, the Bombers put the game safely out of Camden’s reach; and although the Cats finally broke the drought late in the term, the Bombers were 31 points clear as the players went into their groups at three quarter time. Although the North Shore contingent around the clubhouse was noticeably smaller by the time the last quarter came around, the Bomber brigade hadn’t gone any further than the car park; and North Shore goals were greeted with a cacophony of car horns. 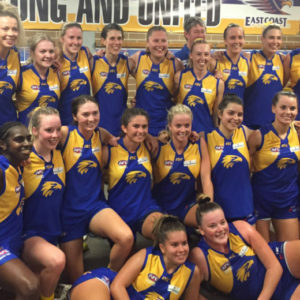 Three times they rang out during the last quarter as the Bombers raced to an unassailable lead. To the Cats’ credit, they kept fighting and scored the last three goals, ensuring parity for the final term which ended as it began with the Bombers 31 points ahead. 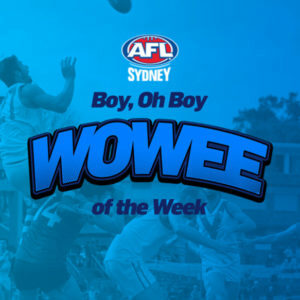 Brad Plug was outstanding for North Shore, controlling the scoring flow with five goals in a best-on-ground performance; while Shaun Crane and Erol Sertbas also featured prominently for the Bombers. The Bombers had been given a test against the Cats, but had done enough to get the win and maintain their unbeaten run in 2018 and the ladder leadership. Aiden Bell, Shane Doherty and Nathan Kenny were best for the Cats. The home side weren’t able to get the win; but showed enough to demonstrate that they belong at this level as they fought all the way against a highly-fancied opponent in an entertaining and enjoyable contest. NORTH SHORE GOALS – B Plug 5, M Thomas 3, M Buskariol 2, A McConnell, E Sertbas, C Barker. CAMDEN CATS GOALS – J Ayling 3, B Pearce 2, J Ware, C Marsh, J Kunde. NORTH SHORE BEST – B Plug, S Crane, E Sertbas, M Marquez, J Cubis, J Campball. CAMDEN CATS BEST – A Bell, S Doherty, N Kenny, B Pearce, T Georgiou, L Vella.